(Left) Jared horsing around during a survey in Algood, Tennessee. (Right) Excavating in a rockshelter on Raccoon Mountain, Marion County, Tennessee. Welcome to the Tennessee Council for Professional Archaeology (TCPA) fifth annual “30 Days of Tennessee Archaeology” blog fest. I can’t believe it’s been five years already. We have seen so many interesting topics covered over the years during our blogfest. When TCPA first started the blogfest, we simply wanted to increase public outreach and make Tennessee archaeology more accessible to everyone. I say we exceeded our expectations! We’ve even seen other states become inspired to do their own 30 days of archaeology including Kentucky which is also doing their 30 days of archaeology blogfest this month. For those who may not know, Tennessee Archaeology Awareness Month (TAAM) takes place each September and is marked by a variety of events across the state that promote Tennessee’s archaeological heritage. TAAM has been official since 2015, when the bill creating this designation was signed into law. Bill signing making Tennessee Archaeology Awareness Month official! (June 2015). Prior to that, Tennessee had been celebrating Tennessee Archaeology Awareness Week since 1995. The bill making TAAM official states the month of September will be used to “encourage citizens to learn more about prehistoric and historic archaeology in Tennessee”. What better way for citizens of Tennessee to learn more about archaeology than by our annual blogfest! Each day in September an archaeologist working or conducting research in Tennessee will contribute a short blog post highlighting their work. You’ll learn about current research, the latest discoveries, and how new technologies are changing our understanding of Tennessee’s past. Over the next 30 days, you’ll hear from archaeologists at various stages in their careers, from students to professors and other archaeologists who work for state and federal agencies and private archaeological firms. You’ll learn about archaeological sites and research projects covering all three grand divisions of Tennessee (East, Middle, and West). We have blog topics that cover the entire history of Tennessee from the first people to inhabit Tennessee over 14,000 years ago to excavations of the African American Rosenwald Schools dating to the early twentieth century. You’ll also hear about what it’s like to be an archaeologist, some of the functions of the Tennessee Division of Archaeology and other public outreach regarding archaeology. As you read the blogposts, you’ll see how archaeologists in Tennessee are working to promote, preserve, and document irreplaceable archaeological sites for future generations. These blogposts allow us to share what we know about the past with the public that supports our work. In an addition to the blogfest, we’re also excited to announce our second annual Archaeology Day! It will take place on Saturday, September 8th at Bells Bend Park in Nashville from 10am to 3pm. Archaeology Day is free and open to everyone. We have all sorts of activities planned and you can find out more about Archaeology Day by visiting our Facebook page. You can also read all about last year’s Archaeology Day as well as this year’s event as a featured blog post on Tuesday September 4th. So mark your calendars for Saturday September 8th and join us at Bells Bend Park for what will surely be another fun and educational day for archaeologists of all ages! Two other archaeological themed events will take place across the state during Tennessee Archaeology Awareness Month. Today, Pickett CCC Memorial State Park in Pall Mall on the Upper Cumberland Plateau is hosting their 2nd annual Archaeology Day event in conjunction with the Pickett Archaeology Museum and East Tennessee State University Research Station. Visitors can tour the Pickett Archaeology Museum and see demonstrations of atlatl throwing, pottery making, and flint knapping. This event is free and open to the public. Then, on Saturday September 23rd from 1 to 4 PM, join the Rutherford County Archaeological Society for their Archaeology Day at the Pavilion at Oaklands Park in Murfreesboro, Tennessee. The Rutherford County Archaeological Society has been putting on an Archaeology Day since 2015 and will have plenty of activities that will be tons of fun with learning for all ages with numerous archaeological displays, artifacts, and hands-on activities, crafts, and games! If you can’t make it to these events, you can always visit a Tennessee state park anytime throughout the year. Many of our state parks feature historical events throughout the year and many feature archaeology front and center including Pinson Mounds State Archaeological Park, Old Stone Fort State Archaeological Park, Dunbar Cave State Park, and Fort Loudon State Park just to name a few. Whether you follow along with the blog fest daily, join us for one of the many archaeology themed events, we hope you come away from TAAM with a better understanding of the depth, richness, and diversity of Tennessee’s archaeological record, the settings in which professional archaeologists work in the state, and the important roles their institutions, agencies, and firms play in documenting and preserving archaeological sites in our great state. So be sure to check in each day for a new post. You can read each post on our blog or you can follow us on Facebook to get each post in your daily news feed. We encourage you to share each post on social media and to reach out to the authors if you have questions or would like more information about a specific topic. Also, make sure to check out all the blog entries from the last four years of our Tennessee archaeology blogfest (2014, 2015, 2016, 2017). Also be sure to check out TCPA’s Facebook page where you’ll find a comprehensive list of archaeological activities, lectures, and other events during Archaeology Awareness Month and throughout the year. Also please consider becoming a member of TCPA. Membership is only $20 and $10 for students and you help support great programs including our blogfest! At the end of the month, I’ll be back to recap the blog fest and let you know what other TCPA events we have in store, including the Current Research in Tennessee Archaeology (CRITA) held each year in January at Montgomery Bell State Park. Until then, welcome to Tennessee Archaeology Awareness Month and let the blogfest begin! The Cumberland River Valley (CRV) in Tennessee exhibits a remarkable archaeological sequence including more than 5,000 recorded ancient Native American sites. 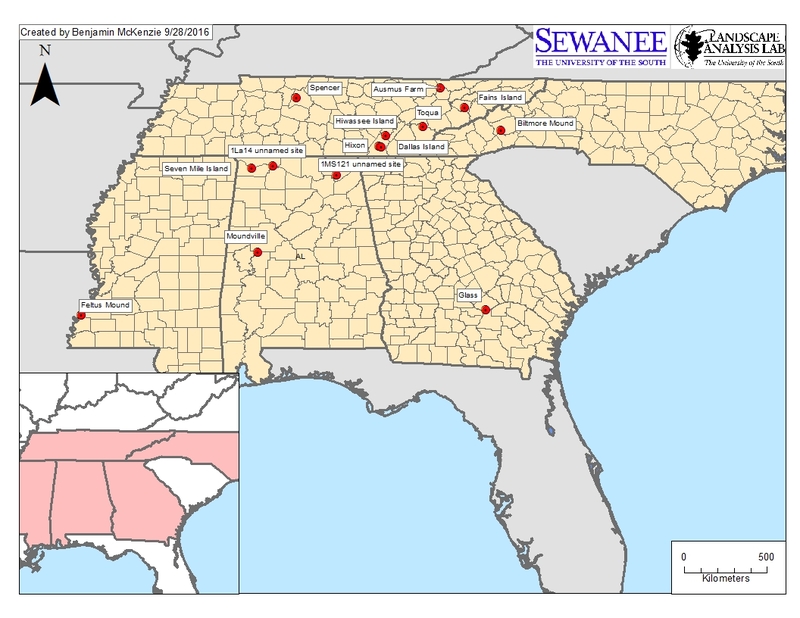 Our understanding of the prehistoric sequence in the region is the result of thousands of excavations and surveys, including efforts by antiquarian scholars, archaeological consultants, state and federal agency archaeologists, colleges and universities, and Tennessee’s avocational archaeological community. However, while these investigations have contributed a tremendous body of data to archaeological understandings of Tennessee and the American Southeast, they have until recently only scratched the surface of one particular cultural component: Archaic shell-bearing sites. To date there are 51 recorded prehistoric shell-bearing sites within the CRV, at least 40 of which can be dated to the period between ca. 6000 and 1000 cal BC. These sites are typically situated on remnant levees or lower terrace formations of larger waterways, and often overlook confluences. Shallow gravel bars situated at those confluences prior to historic dam and channel construction were once the natural habitat of freshwater mollusks including both gastropods (snail) and bivalves (mussels). It is the remains of these creatures that comprise the defining element of shell-bearing archaeological sites. While shell-bearing sites in other areas of the Southeast are composed predominately of bivalves, many of the CRV sites consist primarily of gastropod remains. These 5,000-year old examples were excavated from along the Cumberland in Davidson County. Concentrations of freshwater shellfish also appear during the Archaic period at sites along other interior waterways of the Southeast, including the Green River and its tributaries in Kentucky, the Tennessee River in Alabama and Tennessee, and the Duck River in Tennessee. These sites have been historically labeled either “shell mounds” or “shell middens,” although more recent discussions from the interior Southeast favor the descriptor of “shell-bearing.” Archaic shell-bearing sites in other drainages have been intensively investigated as a result of efforts by antiquarian scholars, pre-inundation survey and salvage efforts, and the Shell Mound Archaeological Project along the Green River, as well as through more recent data reanalysis. Conversely, few formal archaeological studies have taken place at Archaic shell-bearing sites in the CRV prior to the past decade. The presence of prehistoric shell deposits in Cheatham, Sumner, and Wilson Counties was noted in the 1940s and 1950s during reservoir surveys by the Smithsonian Institution River Basin Survey. Unfortunately, those reports contain little useful information regarding the character or in many instances even the specific locations of identified sites. Subsequent surveys of the Cordell Hull and J. Percy Priest Reservoirs by Dan Morse and colleagues from the University of Tennessee-Knoxville investigated shell-bearing deposits at six sites in Jackson and Smith Counties, culminating with Morse’s 1967 dissertation on Robinson Shell Mound (40SM4). Morse’s dissertation constitutes the first research-driven effort at interpreting Archaic shell-bearing deposits in the region. Investigations of shell-bearing sites in the CRV between 1970 and 1990 were similarly sporadic. The Tennessee Division of Archaeology (TDOA) conducted informal examinations of nine shell-bearing sites in Davidson and Cheatham counties in 1976 and 1977 as part of a statewide prehistoric site survey, but recorded little information on those deposits. Another more concerted TDOA effort led to data recovery excavations at the Penitentiary Branch site (40JK25) in Jackson County, directed by Patricia Cridlebaugh in 1976. A second edition of the Penitentiary Branch report was issued by the TDOA this year, and is available as a free PDF. Four years after the work at Penitentiary Branch, efforts by John Dowd and Bruce Lindstrom at the Anderson site (40WM9) along the Harpeth River marked the first systematic investigation of a shell-bearing site in the western portion of the CRV. Through collaboration with the avocational and academic community, Dowd created a report geared towards informing the public while also generating a data set that continues to provide new information. Since the 1990s, Section 106 compliance, burial removals, and salvage work have all contributed additional data on shell-bearing sites in the region. A profile of shell-bearing deposits at the Anderson site in Williamson County, as drawn by John T. Dowd. Since 2010, efforts combining site survey and monitoring, salvage, targeted excavations, and examinations of radiocarbon chronologies in Davidson and Cheatham Counties have revealed significant new information about shell-bearing sites in the CRV. The majority of this work was conducted in 2010 and 2012 under the auspices of the Middle Cumberland Archaeological Research Project (MCARP) directed by Tanya Peres, and the University of Tennessee’s Bells Bend Archaeological Project (UT-BBAP). Following the Cumberland River floods of 2010 the MCARP surveyed 128 sites along the Cumberland near Nashville to identify natural and anthropogenic disturbances, including eight sites with Archaic shell-bearing components. During 2010 and 2012 field seasons, the UT-BBAP examined a total of 25 previously recorded sites in the western CRV, including three with Archaic shell-bearing deposits. Finally, in the summer of 2012 Peres directed field school excavations at 40DV7. The information recovered from these various investigations resulted in a series of conference papers, scholarly articles, and a multiple property nomination for the National Register of Historic Places, all of which have laid the groundwork for broadening our understanding of the shell-bearing Archaic in the CRV. Joey Keasler inspects looted shell-bearing deposits along the Cumberland in September, 2010. So what’s next for the CRV sites? I’m pleased to have worked over the past year with Tanya Peres to draw together some of the recent research described above with contemporary examinations of previously excavated sites into a new edited volume we recently submitted to the University Press of Florida. In addition to Tanya and myself, contributors to that work include David Anderson, Thad Bissett, Stephen Carmody, Andrew Gillreath-Brown, Kelly Ledford, Shane Miller, Dan Morse, Joey Keasler, Ryan Robinson, Leslie Straub, and Andrew Wyatt. That manuscript is presently out for review, and we hope to have the final book in hand late next year. We hope that volume will facilitate comparative examinations of sites throughout the Southeast, as well as and inspire other archaeologists to look more closely at shell-bearing deposits along the Cumberland. In June 2017, the Pinson Environment and Archaeology Regional Landscape (PEARL) Project undertook its fourth and longest season of fieldwork at the Johnston site, located along the South Fork of the Forked Deer River in West Tennessee. During the Middle Woodland period (ca. 200 BC – AD 500), this region witnessed an explosion of mound-building and related ceremonial activities, most famously at Pinson Mounds, the largest Middle Woodland mound site in the Southeast. As we’ve noted in previous blog posts, 2014 and 2015, about our project, parts of the Johnston site appears to pre-date the mounds and occupation at Pinson (located approximately two miles upstream), providing an opportunity for archaeologists to investigate the roots of Middle Woodland ceremonialism and monumentality in West Tennessee. Appalachian State University senior Megan England, with a broken biface recovered from the plowzone at the Johnston site. Between 2014 and 2016, the PEARL Project collected multiple types of non-invasive geophysical data at Johnston using gradiometry, ground penetrating radar, and magnetic susceptibility. These techniques allowed us to identify a range of subtle differences in sub-surface deposits (called anomalies), some of which represent the remains of human activity in the form of archaeological features. Guided by these data, we conducted targeted excavations of anomalies across much of the 30-ha site, revealing pits of varying sizes, postholes, a hearth, a shallow ditch enclosure, and the remains of a mound that was mapped in the early 1900s but is virtually undetectable on the ground surface today. Although up to now these excavations have yielded very few diagnostic artifacts, radiocarbon dating of ancient plant remains indicate that some of these features were in use as early as the Middle Archaic period, ca. 6000 cal. BC. This summer, we conducted our first full-length archaeological field school at Johnston with students from Appalachian State University, under the direction of Dr. Alice Wright. In addition to practicing basic excavation techniques, students worked closely with PEARL researchers Dr. Sarah Sherwood (University of the South) and Dr. Stephen Carmody (Troy University) to learn how to properly document and sample archaeological deposits for geoarchaeological and paleobotanical analyses. Other members of the PEARL team, including Dr. Casey Barrier (Bryn Mawr College), Dr. Chris Van de Ven (University of the South), and Ed Henry (Washington University of St. Louis), were also on hand to talk students through the process of site mapping and research design. Troweling the walls and floors of one of the units where we identified a Middle Woodland midden below the plowzone. With an extended field season and our capable crew of students, the 2017 excavation included not only small test units where we could ground truth individual anomalies, but also slightly larger excavation blocks in areas with relatively high magnetic susceptibility. Unlike gradiometry, which is capable of measuring fine-grained subsurface variability and identifying the exact location and shape of sub-surface features, our magnetic susceptibility survey coarsely measured magnetic enhancement of the plowzone at regularly spaced intervals across the site. We hypothesized that high “mag sus” readings in the plowzone were indicative of high concentrations of cultural material, such as pottery and organic remains, even where the gradiometer did not detect clear magnetic anomalies. The results of our excavations of two units in the northern portion of the Johnston site support this hypothesis. Across a 28 m2 excavation area, we identified a 10-15 cm-thick midden below an artifact-rich plowzone. While we have yet to radiocarbon date any of the material recovered from these units, diagnostic projectile points and potsherds date to the Middle Woodland period. As such, this midden may be contemporaneous with some of the mounds at Johnston, and future analyses of its assemblage may reveal what sorts of off-mound activities coincided with some of the earliest monumental architecture in West Tennessee. Appalachian State senior Chris Flowers (far right) teaching Junior Rangers about projectile points. Throughout the season, the field school benefitted from the resources and support of Pinson Mounds State Archaeological Park, where we set up our lab (and were occasionally on display!) in the park museum. For the fourth consecutive year, we helped the Park host Junior Ranger Day for elementary school students. Thanks to our discovery of the midden, Appalachian State students were able to teach “junior rangers” about lithics and ceramics using materials excavated days earlier; in turn, the “junior rangers” helped us considerably by washing many of these artifacts! As always, PEARL is grateful for our partnership with the Park and the Tennessee Division of Archaeology, and we look forward to returning to Johnston next year to continue this research. The 2017 PEARL/Appalachian State University field school on backfill day. Authors: Alice Wright is an Assistant Professor in the Department of Anthropology at Appalachian State University. Autumn Melby is a senior anthropology major at Appalachian State University, and was the teaching assistant for the 2017 field school at Johnston. The chipped tool stone resources of the Highland Rim physiographic province are as plentiful as they are variable. Major chert bearing formations include the Ste. Genevieve, St. Louis, and Fort Payne as many of us are familiar with. However, a number of other tool-stone sources were available to prehistoric peoples across the region. The Tuscaloosa Gravels (Pickwick/Horse Creek var. ), Camden, and Bigby Cannon were also exploited by prehistoric peoples of the region. Brassfield chert is an additional lesser known source and the purpose of this brief post is to highlight the occurrence, macroscopic description, and potential use of Brassfield chert through time. As the Tennessee River turns northward dropping off the fall line it leaves the Mississippian aged carbonate formations of Northern Alabama and dissects older deposits of Silurian aged limestones/dolomites. The Tennessee River Valley, or Western Valley, and its tributaries expose the underlying basement rock of the Highland Rim. A light grey fossiliferous limestone/dolomite, the Brassfield formation is the oldest Silurian aged deposit and overlies the Ordovician limestone. The Brassfield is overlain itself by the younger middle and upper Silurian units (Wayne Group, Brownsport) and the Devonian carbonates including the chert bearing Camden. Fossils present include a variety of marine invertebrates, corals (horn), urchins, crinoids (echinoderms), and sponges (stromatoporoids). Outcropping along the river beginning in Hardin Co., the formation is exposed to the north in Wayne, Decatur, and Perry Counties flanking the valley both on the western and eastern margins (figure 1). The Brassfield formation is found at the lowest elevations (<400 ft) sometimes only exposed during draw down periods of the river during the fall and winter months. Brassfield chert is also present in Indiana, Kentucky, and Ohio where it makes up a minor source material in prehistoric assemblages. Brassfield chert is intermittently observed in the Western Valley of varying quality (tractability). The chert exists as irregular beds (3 to 15 cm thick) and round to slightly flattened nodules (figure 2). In most deposits the exposed chert contains fossiliferous inclusions and may be highly fractured. However, extremely high quality deposits are present with cryptocrystalline conchoidal surfaces. The typical variety of Brassfield chert is described as a light olive gray (5y 5/2) with a dark blue (5PB 3/1) center. However, other common varieties exhibit a dark yellowish orange (10YR 6/6) to dark red (10R 3/6) center occasionally containing seams of milky white (N8) translucent microcrystalline quartz (figure 2). These translucent seams appear to be stems of marine organisms completely replaced by silica. Cortex is a darker grey silicified limestone and occasionally contains numerous crinoid stems and fragments of other marine fossils. Artifacts manufactured from Brassfield can range in color from green to blue with red yellow and milky white (figure 3). Signs of prehistoric procurement, in the form of debitage, were noted at two of the deposits sampled though these may have come from locations uphill or slightly upstream. The friable highly eroded bluff faces create a pavement of fragmented chert blocks and nodules readily available, discouraging quarrying directly from the deposit face. Secondary deposits of Brassfield chert were observed in gravel bar deposits of sufficient size for most utilitarian tools. Thermal alteration of Brassfield chert does not appear to occur as the fine grained texture creates a homogenous material for fracture propagation. Hydrating solid blocks via water emersion would be a better approach from a mechanical perspective. Brassfield chert does not appear to have been widely exploited outside of the region, excluding sources in Kentucky, Indiana, and Ohio. Brassfield chert is identified as a minor raw material source within all of the major temporal prehistoric divisions of central Tennessee. Paleoindian and Early Archaic projectile points from the region are identified, though rarely, as being manufactured from Brassfield chert. More intensive exploitation does not appear to occur until the Late Archaic when ‘lesser’ quality materials are being utilized in general, trailing off throughout the Woodland and Mississippian periods. This may be due to the co-occurrence of large deposits of Fort Payne chert which dominate the surficial geology at higher elevations in the Lower Tennessee River Valley. Eroded cultural deposits along the river beaches attest to the perceived preference to the wood grained brown and dark black varieties of Fort Payne chert despite the immediate proximity to Brassfield outcrops. Site assemblages with a large component of Brassfield chert may be an indicator of seasonal use of riverine or sheltered low elevation resources and or restricted mobility within these regions. However, it is the hope of the authors that an increased familiarity with Brassfield chert (aka Clifton agate) may lead to more accurate material identifications. As a precaution, the typical high quality variety of glossy blue/green Brassfield chert closely resembles varieties of both the Ste. Genevieve and Upper St. Louis found along the northern and eastern margins of the Highland Rim. Specifically, variants of Upper St. Louis materials found in the karst regions of the Kentucky and Tennessee border exhibit similar visual attributes. Our understanding of past peoples greatly benefit from an understanding of geographic, geologic, and seasonal resource availability. The researcher armed with a geoquad map adds to our collective understanding of prehistoric people. After a six-year hiatus, Middle Tennessee State University’s annual archaeological field school recently returned to the Castalian Springs Mound Site in Sumner County. Unlike previous efforts, this year’s field school was conducted several hundred yards south of the mound center near the site’s mineral springs, an area that had not been explored professionally for over 100 years. Photo of one of the mineral springs after a rain. Over the past several decades, the springs at Castalian Springs have been buried underneath alluvium from a nearby creek to the south. The presence of this alluvium on top of the springs makes it appear as if the springs have “dried up.” However, as one of our field school students Shonda Clanton discovered, fresh spring water can still be found about two feet below the ground surface when the proper tools are used. Shonda Clanton using a bucket auger. Beginning around A.D. 1200, these mineral waters would have been of great importance to the folks living at Castalian Springs until the site was abandoned sometime shortly before A.D. 1400. Elsewhere in the late prehistoric Southeast, springs like these were often involved in the production of salt, a mineral that had both ritual and culinary uses in many American Indian cultures. Salt would have also been a vital component in the diets of maize agriculturalists, since corn only contains a trace amount of this physiologically-necessary substance. Given the importance of salt and salt production in the late prehistoric Southeast, we were surprised to discover that there was little evidence of large-scale salt manufacture and trade at Castalian Springs. While there were some fragments of large, shallow “saltpans” that could have been used to evaporate or boil salty brine to be sure, this was not the only activity occurring at the mineral springs. Students and volunteers excavating on the high ground near the mineral springs. As the mineral springs are located in the floodplain of the nearby creek, the ideal place for folks working at or living near this area would have been on a built-up linear feature a few dozen yards away from the springs. Not surprisingly, it was on this high ground where we found the majority of our archaeological remains. These included large quantities of feasting debris, bone needles, several postholes from ancient structures, a few “smudge pits” filled with corn and wood used for creating smoke, as well as some exotic items like mica, copper-stained wood, and even a fluorite bead—a first for the Castalian Springs site. It seems apparent from remains like these that the mineral springs were hubs for a variety of communal, religious, and economic activities. Given that the field school was only able to explore a small portion of the area immediately surrounding the mineral springs, we are planning on returning next summer to expand upon our initial excavations. While it is possible that this future work will uncover large quantities of salt production debris at other parts of the site, it is clear that these springs were important, ritually-charged places on the landscape for the American Indians at Castalian Springs some 800 years ago. Welcome to Tennessee Archaeology Awareness Month! On behalf of the Tennessee Council for Professional Archaeology, let me be the first to welcome you to Tennessee Archaeology Awareness Month and to the fourth annual “30 Days of Tennessee Archaeology” blog fest. Tennessee Archaeology Awareness Month takes place each September and is marked by a variety of events across the state that promote Tennessee’s archaeological heritage. The annual blogfest is TCPA’s signature event celebrating Archaeology Awareness Month. Each day in September an archaeologist working or conducting research in Tennessee will contribute a short blog post on their work. You’ll learn about current research, the latest discoveries, and how new technologies are changing our understanding of Tennessee’s past. Over the next 30 days, you’ll hear from archaeologists working in universities, state and federal agencies, and private archaeological firms. You’ll learn about archaeological sites in every part of the state from Bristol to Memphis and everywhere in between. You’ll learn about the first people to inhabit Tennessee more than 8,000 years ago, ancient mound builders in middle and west Tennessee, including how ancient Tennesseans may have understood celestial events like the recent total solar eclipse. You’ll get an update on archaeological excavations at the Civil War era “Cotton Gin” site, a pivotal location in the 1864 Battle of Franklin. You’ll also learn about lesser known people whose histories often went unrecorded in the historical record, like enslaved African Americans and early Irish immigrants to Tennessee. You’ll hear about research on specific kinds of archaeological materials, like stone tools and food remains, as well as technological applications that are changing our understanding of Tennessee’s past and leading to new questions altogether. You’ll also be treated to several retrospective posts on the history of Tennessee archaeology and examples of public or service-oriented archaeological projects across the state. Finally, and perhaps most importantly, you’ll see how archaeologists in our state are working to preserve and document irreplaceable archaeological sites for future generations and share what we know about the past with the public that support our work. In an addition to the blogfest, we’re also excited to announce our first ever Archaeology Day! It will take place on Saturday, September 16th at Bells Bend Park in Nashville from 10am to 3pm. Archaeology Day is free and open to everyone. We will have a variety of activities focused on learning about archaeology and on local and state history. You can find out more about Archaeology Day by visiting our Facebook page. So mark your calendars and join us at Bells Bend for what will surely be an educational and fun day for archaeologists of all ages! Two other archaeological themed events will take place across the state during Tennessee Archaeology Awareness Month. On Saturday, September 9, Pickett CCC Memorial State Park in Pall Mall on the Upper Cumberland Plateau will host an Archaeology Day event in conjunction with the Friends of Pickett State Park to celebrate the recent opening of the Pickett Archaeological Museum and East Tennessee State University Research Station. Visitors can tour the newly opened Pickett Archaeology Museum and see demonstrations of atlatl throwing, pottery making, and flint knapping. This event is free and open to the public. Then, on Saturday and Sunday, September 16 and 17, Pinson Mounds State Archaeological Park near Jackson, will host the 35th annual Archaeo Fest. Visitors will be treated to a variety of programs on cultural and natural history of the region. Archaeologist Bill Lawrence with the Tennessee Division of Archaeology will give a tour of Pinson Mounds each day of the event. If you can’t make it to these events, you can always visit a state archaeological park anytime throughout the year. Whether you follow along with the blog fest daily, join us for one of the archaeology themed events, we hope you come away from Archaeology Awareness Month with a better understanding of the breadth and diversity of Tennessee’s archaeological record, the settings in which professional archaeologists work in the state, and the important roles their institutions, agencies, and firms play in documenting and preserving archaeological sites in our great state. So be sure to check in each day for a new post. You can read each post on our blog or you can follow us on Facebook to get each post in your daily news feed. We encourage you to share each post on social media and to reach out to the authors if you have questions or would like more information about a specific topic. Also be sure to check out our event calendar where you’ll find a comprehensive list of archaeological activities, lectures, and other events during Archaeology Awareness Month and throughout the year. I’ll check back in at the end of the month to recap the blog fest and let you know what TCPA has in store for the rest of the year. Until then, welcome to Tennessee Archaeology Awareness Month and let the blogfest begin! In last year’s 30 Days of Tennessee Archaeology blog post, Secrets in the Smoke: Prehistoric Tobacco Use in Tennessee, we discussed the results of both pollen analysis and gas chromatography/mass spectrometry (GC/MS) analysis on archaeologically-recovered pipes and pipe residues from the state of Tennessee. Thanks to research funds provided by the Eastern Band of Cherokee Indians, we are happy to report new findings. Having nearly exhausted the collections at the McClung Museum of Natural History and Culture at the University of Tennessee, Knoxville, we were fortunate to gain additional access to pipes from sites in Alabama, Georgia, Mississippi, and North Carolina. We selected pipes based upon cultural and temporal affiliation and for the amount of residue. Once selected, residues were carefully removed, so as not damage the pipes. Afterwards, faculty and students from the Department of Chemistry at Rhodes College in Memphis, Tennessee extracted organic compounds from the residues and analyzed them using GC/MS. This year we sampled 55 pipes, of which 35 produced positive evidence of tobacco use. Pipe recovered from the Seven Mile Island site (1LU21). 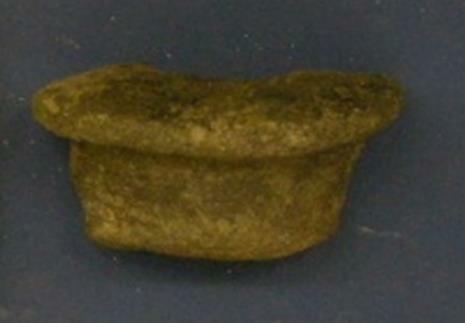 Pipe fragment recovered from the unnamed 1MS121 site in Marshall County, Alabama. Thirty-one Alabama pipes comprised the majority of our sample. These are curated at the University of Alabama, Office of Archaeological Research. Twenty-seven derive from the Moundville site in west-central Alabama and four derive from three Tennessee River Valley sites in north Alabama: 1La14, 1Lu21 (see above), and 1Ms121 (see image to right). With the exception of the pipe from 1La14, a Copena mound site, all pipes are Mississippian in age. In total, sixteen of the Moundville pipes and all four Tennessee Valley pipes tested positive for nicotine. We also tested two pipes currently housed at the Fernbank Museum of Natural History in Atlanta, Georgia and one other curated at the Antonio J. Waring Jr. Laboratory at the University of West Georgia. The two Fernbank pipes come from the Glass site in Telfair County, Georgia, a late prehistoric Native American site (ca. AD 1450-1550) visited by Spanish conquistador Hernando de Soto. Dr. Dennis Blanton of James Madison University, Virginia has been excavating at Glass since 2006. One of the two pipes from Glass tested positive for nicotine. One pipe fragment from the collections at the Waring Lab was also submitted for analysis. The first came from the Buzzards Roost site, a historic Creek town located in Taylor County, Georgia. The fragment produced a positive nicotine signature. 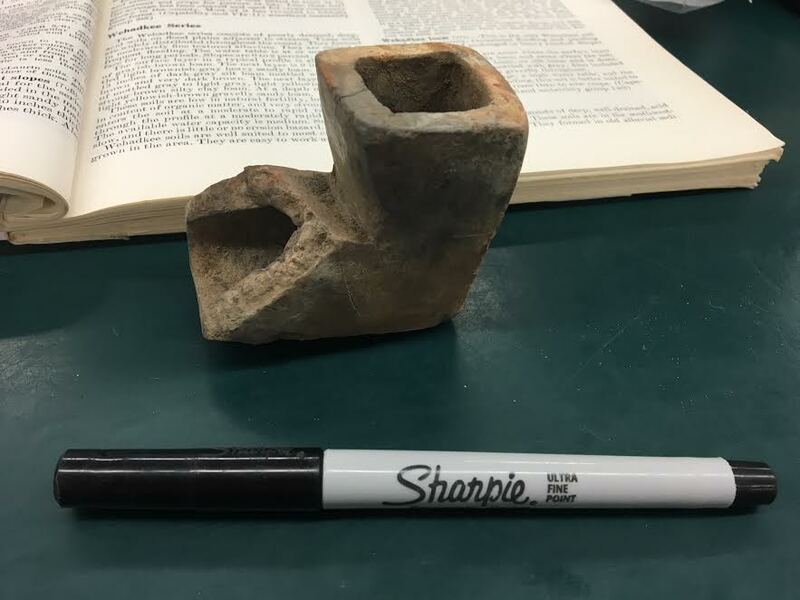 Pipe fragment recovered from the Biltmore Mound. Image courtesy of Dr. Larry Kimball. 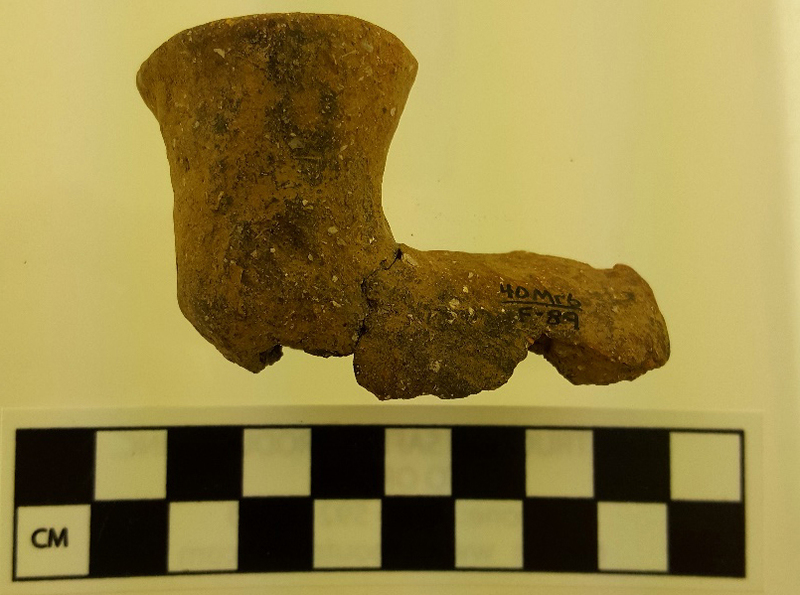 Dr. Larry Kimball, Professor of Anthropology and Director of the ASU Laboratories of Archaeological Science at Appalachian State University in Boone, North Carolina, provided us with a sample from his excavations at the Biltmore site (31BN174) in Asheville, North Carolina. 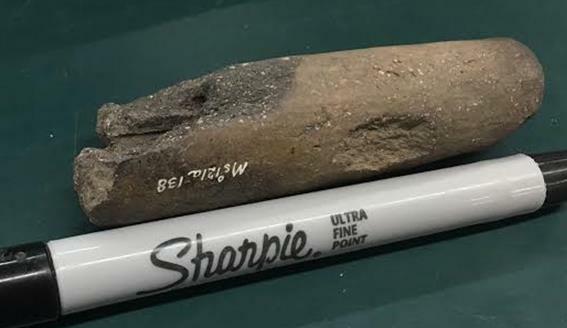 The pipe was recovered from a posthole in the center of a Middle Woodland Connestee phase platform mound, indicative of the Hopewellian culture in western North Carolina, eastern Tennessee, and northern Georgia (see profile below). The Middle Woodland date for the pipe makes it possibly the earliest evidence of tobacco use in North Carolina and the Appalachian region. Drawing of Biltmore Mound showing Posthole 21, where the pipe fragment was recovered. Image courtesy of Dr. Larry Kimball. Six pipes were also made available to our study from the Feltus site (22JE500) located in Jefferson County, Mississippi. The three-mound site dates to the late Baytown through middle Coles Creek periods (AD 700 – 1100). From 2006 to 2012, faculty and students from the Research Laboratories of Archaeology at the University of North Carolina, Chapel Hill excavated at Feltus and they are hoping to return in 2017. Each of the six pipes submitted for analysis tested positive for nicotine. Pipe tested from the Fains Island site (1JE1). Six pipes sampled from the collections at the McClung Museum produced evidence for the use of tobacco. Five of these pipes were recovered during archaeological excavations, and one was donated to the museum from a once privately-held collection, the Barnes Collection. Three of the pipes were recovered from sites excavated during the Chickamauga Basin Project prior to the construction of the TVA Chickamauga Reservoir, between 1936 and 1939 (Lewis, Lewis, and Sullivan 1995). The pipes were recovered from the Dallas site (8HA1), the Hixon site (1HA3), and the Ledford Island site (16BY13). Pipe analyzed from the Toqua site (40MR6). The Fains Island site (1JE1 – see image above) was excavated in 1935 as part of the Douglas Reservoir project. The site is a Mississippian period open-air habitation site with a platform mound. Nicotine was also detected in the residue of a pipe recovered from this site. Toqua site (40MR6) in Monroe County, Tennessee, is an open-air habitation site with Mississippian and Cherokee components. 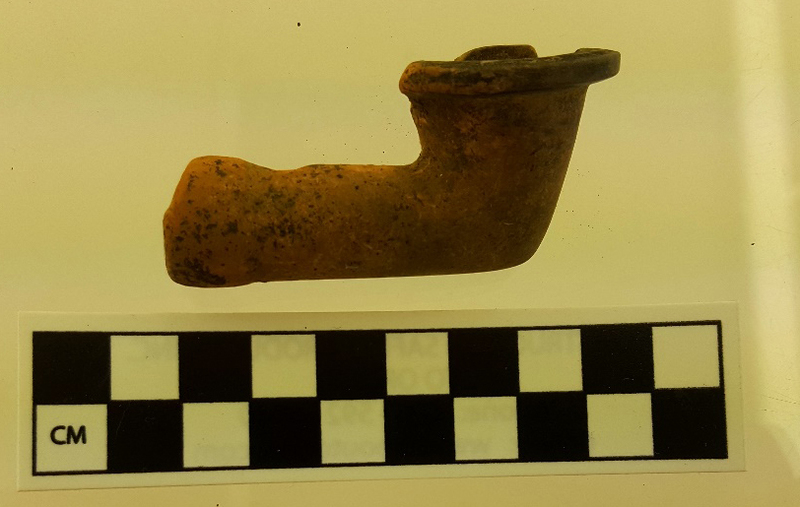 A pipe recovered from a proto-historic feature tested positive for nicotine. A pipe from the Barnes Collection donated to the McClung museum (see image below) was also analyzed and produced evidence for tobacco use. In total, we analyzed 55 pipes from 17 archaeological sites. Thirty-five showed evidence for tobacco use at 13 different sites. Previous evidence for tobacco use at these seeds consists of a single seed from a mound at the Moundville site (Knight 2010). We believe that both our success rate and the new cultural patterns emerging demonstrate the value of GC/MS analysis. Pipe from the Barnes Collection housed at the McClung Museum, UTK. Since the beginning of our project, we have tested 75 pipes from 21 sites for either tobacco pollen or for a nicotine signature. Forty pipes from 17 sites across the Southeast have tested positive for tobacco use. Moving forward, we hope to continue building our database. Eventually we hope to have enough spatial and temporal data to discuss differences in the use of tobacco over time and space, explore the role of other plants in the smoking complex, and better understand the timing and transmission of tobacco into the region. Map showing sites where evidence of nicotine was discovered.